A compilation of highly collectable and rare Surinamese 45's and LP cuts. Compiled by Antal Heitlager & Thomas Gesthuizen this is the follow up to the Kindred Spirits released Surinam! compilation. 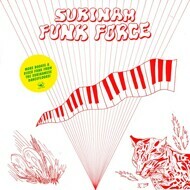 This volume goes even deeper into the field of 70ties and 80ties funk music from the Surinamese dance floors...Recommended! Fresh Artwork by Cosmo Knex. "killer compilation! lots of favorites on there and stuff i still need to find"
"‘Jammin’ is a salacious boogie number, cooked up with quick-fingered bass work, female harmonising and guitar solos."